Fans cheer from the stands. 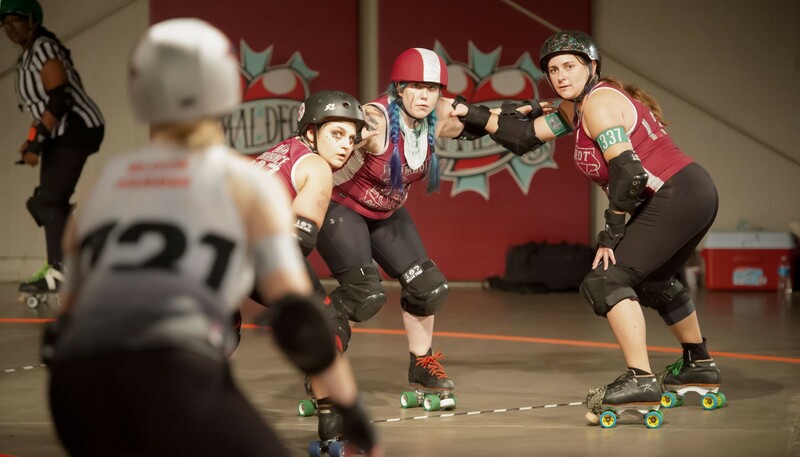 A tripod of HRD blockers wait for the opposing team’s jammer to make a move. The lights dim and the crowd cheers. A line of skaters roll out as a voice ricochets through the arena, announcing their names. Wheels screech and we take our places on the track. Soon we will go head-to-head with the opposing team. It will get physical because this is roller derby. 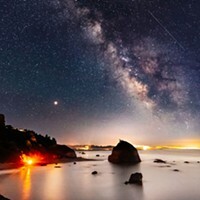 And it will get fun because this is Humboldt County. 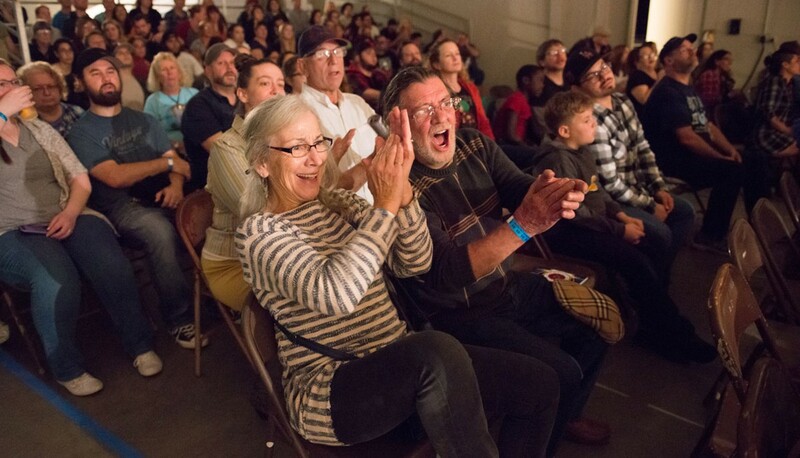 A Humboldt Roller Derby bout draws its share of fanfare, as Francesci Hall at Redwood Acres Fairgrounds (3750 Harris St., Eureka) is transformed into a stadium — equipped with bleachers that can seat nearly 700, the mascot Sassy Sasquatch, an announcer, a digital scoreboard and referees. HRD's very own band turns out to play at every home bout, while onlookers drink local beer and munch on hot dogs, pizza or nachos. All players have an alias (Pushy Galore, Nacho Aimeega, Maude Behavior, Rotten Tula Core and Peaches n' Scream) — an identity that they embody once they enter the arena, often in full makeup. Humboldt Roller Derby began as a drop-in program out of Blue Lake Roller Rink (312 S Railroad Ave.) located inside a middle school gymnasium. Founded in 2006 by Jennifer McMahon and Jason Whitcomb (HRD's lively announcer), who now own local tattoo and piercing shop Primal Décor and STIL, a smoke shop with derby gear, the organization boasts more than 40 active players, 30 junior players, 30 players-in-training, 20 officials and 150 volunteers. 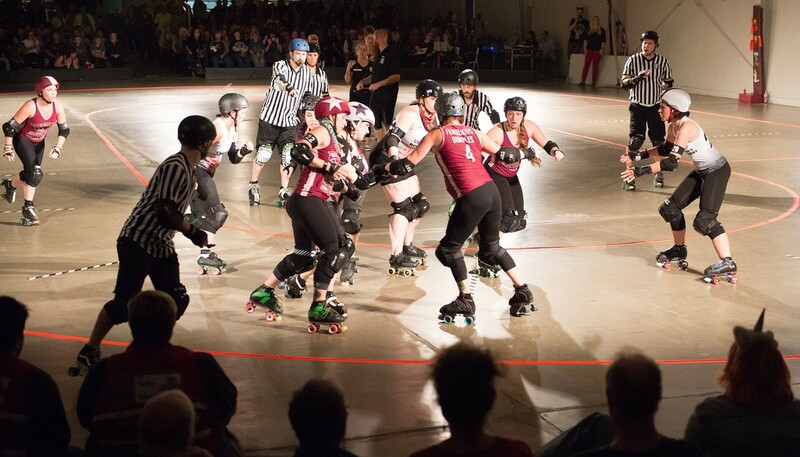 HRD belongs to the Women's Flat Track Derby Association, which means that its charter team travels to compete against other leagues in WFTDA sanctioned bouts internationally. The team won the "Battle of the Borders" championship in Canada in 2017 and took first place in a multi-state championship in Bakersfield. Not shabby for a small-town, home-grown organization. A snapshot of a jam, with both teams’ jammers neck-and-neck. 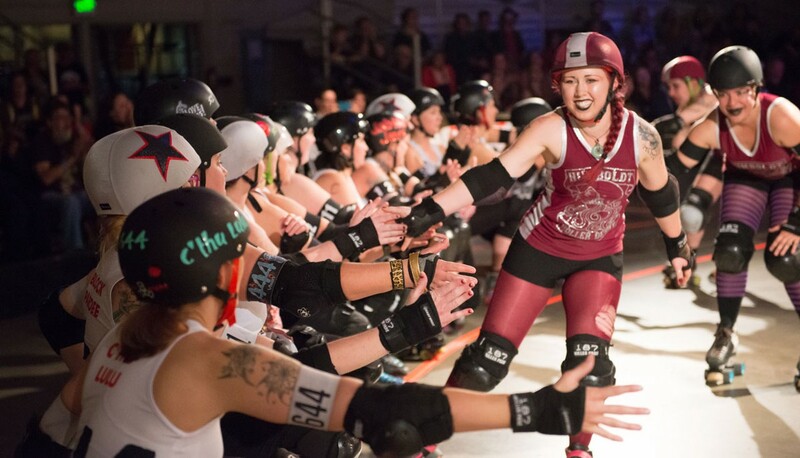 While roller derby may not have the ESPN screen time football or hockey do (though it does have some), it's wildly popular among Humboldt locals. In fact, Humboldt Roller Derby is 100 percent volunteer run. According to HRD's president, the blue-haired, cheetah print-clad Bianca Swagger Fresh 2 Death (Bianca Vierra), unlike other roller derby teams, HRD's Board of Directors, referees, non-skating officials and head coach, Mojo (Joey Cuellar), are all volunteers. One of the leagues star jammers, Spaar Gnar (J. Spaargaren), remarked that when players chant "we love our team" at the beginning of every bout, they not only mean their teammates but everyone who makes HRD possible — fans included. The relationship between HRD and the community is a two-way street and, when not dominating on the track, HRD is also bent on making Humboldt a better place. The team donates a percentage of the proceeds from each bout to other local nonprofits and completes hundreds of volunteer hours every year. The organization also runs the Redwood Saplings youth program, the only full-contact sport for girls in the region. The bond between teammates, who spend grueling hours training, is a lasting one. They're proud of their "derby kisses" (i.e. the bruises you get from skating). And it's not uncommon to hear them say, "Roller derby saved my soul." When asked about this saying, Swagger points out the irony that a physically strenuous — and at times, dangerous — sport offers a safe space for so many of its players. She says that roller derby "feeds you in a way you didn't know you needed. ... Everyone's journey is different. It's beautiful to see their growth." In our beautiful, rural county, HRD offers something edgy and exciting — and, well, very Humboldt — and, as of late, is putting the county on the map in a surprising new way. Catch HRD's home games for the 2019 season from January through October at Redwood Acres. The Redwood Rollers (the A team) and Root Force (the B team) play visiting leagues and the two home teams (comprised of both the A and B teams), the North Jetty Bettys and the Widow Makers, also regularly battle it out on the track. Don't miss the Saplings bouts, which often precede the adult league. Bouts are usually double headers, so you get plenty of bang for your buck. 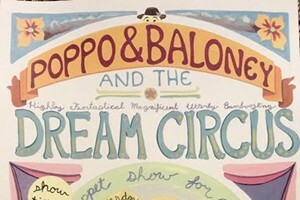 Tickets are available at the door ($15) and in advance at Wildberries Marketplace, People's Records and online at www.brownpapertickets.com. 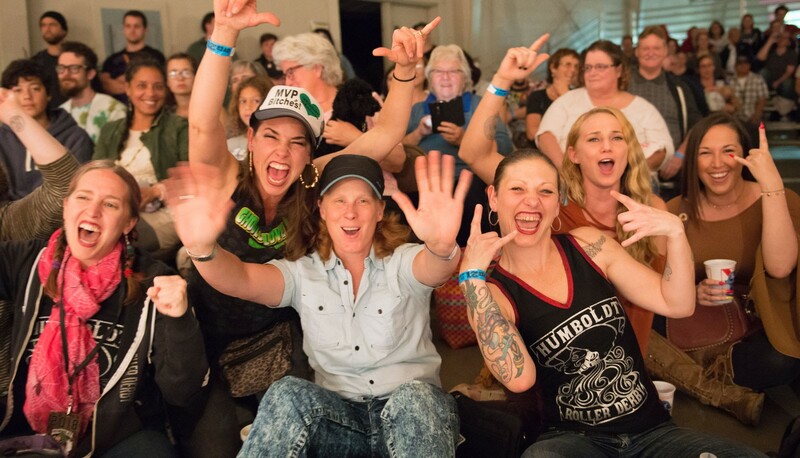 Watch live feeds of the WFTDA Championships at Humboldt Brews (856 10th St., Arcata) and the Arcata Theatre Lounge (1036 G St.) at the end of every official season. 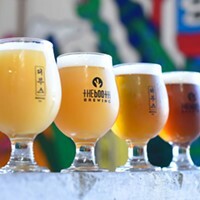 Arrive early and get your beer before the game starts. 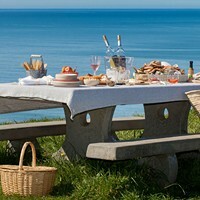 You may not be able to tear your eyes away later. Each team has five players on the track: Four blockers and one jammer. 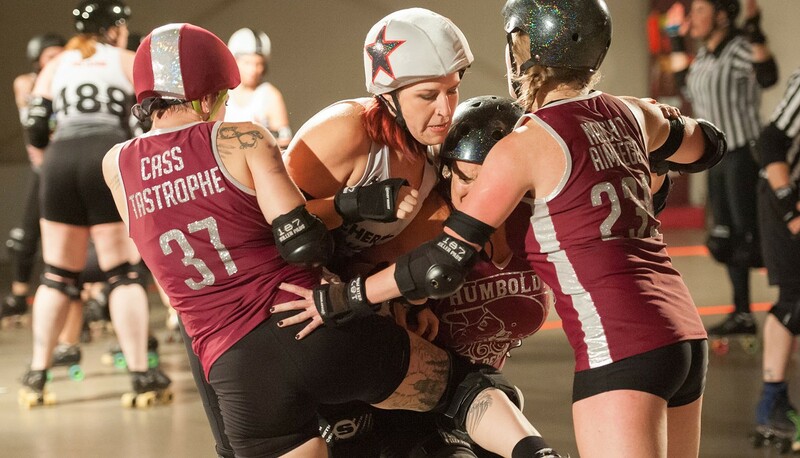 The player with a star on their helmet is the jammer. They score points for their team by making their way past the other team’s blockers. The player with a stripe on their helmet is the pivot. They can “become” the jammer if the star helmet cover is passed to them during the jam. Blockers clear a path for their jammer and stop the opposing teams’ jammer. Each jam lasts two minutes or until the lead jammer calls it off. The bout lasts for two 30-minute periods, with an intermission between. If the crowd starts cheering, you probably should, too. It's likely that the jammer broke through the pack and is making her way around the track and can start scoring points. Or someone got hit hard. The highest scoring team wins. At the end of the game, head to the track to high five your team.